Have you ever asked a friend for advice or their thoughts as you tried on clothing at the store? Or, have you often asked a family member for their opinion on a new paint color for your living room? Usually, it’s a good idea to get an outside perspective for these types of things; however, even in these situations, the ultimate decision is yours. So, it may seem like a good idea to ask for advice on your resume. 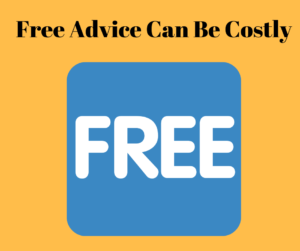 I’m ready to tell you that—in this instance—that ‘free’ advice may be costly. Read on for three reasons why it’s important to find a professional resume writer. #1 – Uncle Bob or Sister-in-Law Amy may not want to hurt your feelings. If you are REALLY looking for someone to give you honest feedback, it’s vital that you ask someone who won’t be afraid of actually giving you the true picture. Therefore, asking a relative or a close friend may not be the best course of action. Instead, think of a current or past colleague (maybe not a close friend) who you know tells it ‘like it is’ and won’t sugar-coat feedback. #2 – Carolyn hasn’t updated her resume for 20 years. You decide to ask Cindy, a professional colleague who you trust and believe can review your resume. The thing is, Cindy has been in the same job for over 20 years and she hasn’t even reworked her own resume during that time. That’s not to say she won’t have valuable feedback; however, is she aware of the correct format for today’s resumes? Does she know anything about Applicant Tracking Systems? Doe she still believe it’s a good idea to include an Objective? Choose someone who is knowledgeable about today’s job market and can position your resume for how today’s systems operate. #3 – Do you hire a licensed plumber or do you call your friendly neighbor, Jeff? If you have a water leak or bathroom issues at your house, do you call someone who is an expert and has a license or are you ‘okay’ with having your neighbor come over and hope for the best? For me, it’s a no-brainer. I want it done right the first time. As much as I may trust my neighbor, I want someone with education and experience so I have confidence in their abilities. A Certified Professional Resume Writer is someone that has continuing education and KNOWS how to write documents for today’s marketplace. Finally, if you ask five people to give you advice on your resume, you will probably get five different opinions and will be more confused than when you started the process. This is YOUR document. Choose someone who can give you excellent advice because this is their area of expertise. You need someone who can be objective and honest with feedback while indicating what you could change for better results. Now, if you want a free resume review from an expert in the industry, contact me today!